Is the World of Dance tour as good as the TV show? Find out! 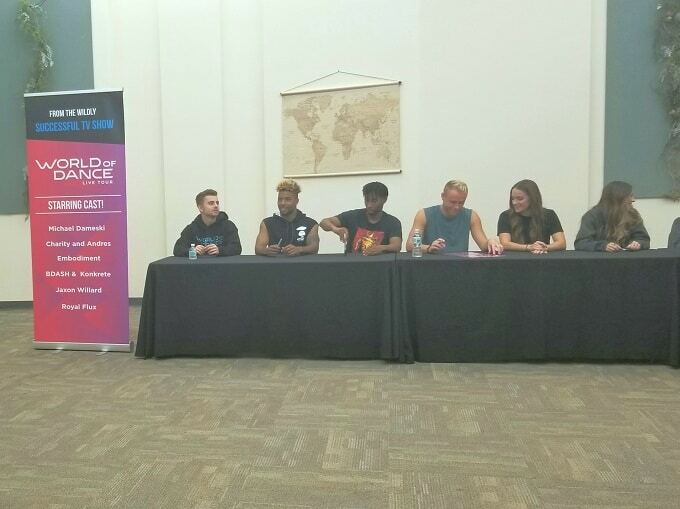 We attended World of Dance Live and experienced the VIP meet and greet with the cast of dancers. After watching season 2 of World of Dance, my daughter and I were thrilled to discover that the World of Dance tour would be coming to a performing arts center near us. I decided to spring for the VIP tickets so that we could meet the dancers as well as have great seats. Here’s my honest review of both the World of Dance tour and the VIP experience. The VIP tickets cost $147 plus fees and tax, as opposed to standard show tickets which cost around $50 plus fees and taxes. One day before the show, I received an email from the performance venue with instructions on when and where to report for the VIP experience. We were asked to arrive at 5:15 pm, which was 2 hours and 15 minutes before showtime, and report to the box office area. We arrived right on time, checked in at the box office, and received wristbands. A few minutes later, a venue employee assembled the VIP group of approximately 50 people into one long line and led us into the building. Before we could enter the medium-sized conference room where the dancers awaited us, we had to pass through security. Bags were visually checked, and each person was scanned with a metal detecting wand. 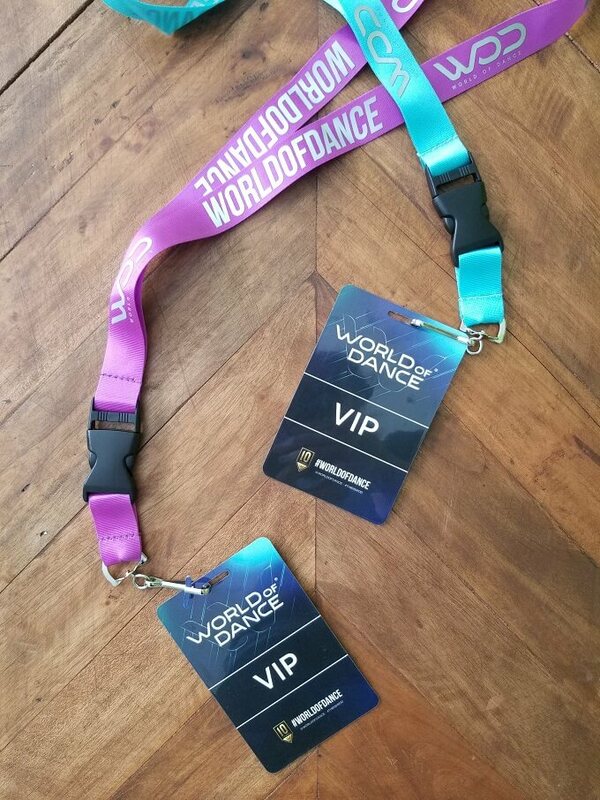 After we cleared security, we each were given a World of Dance VIP lanyard. 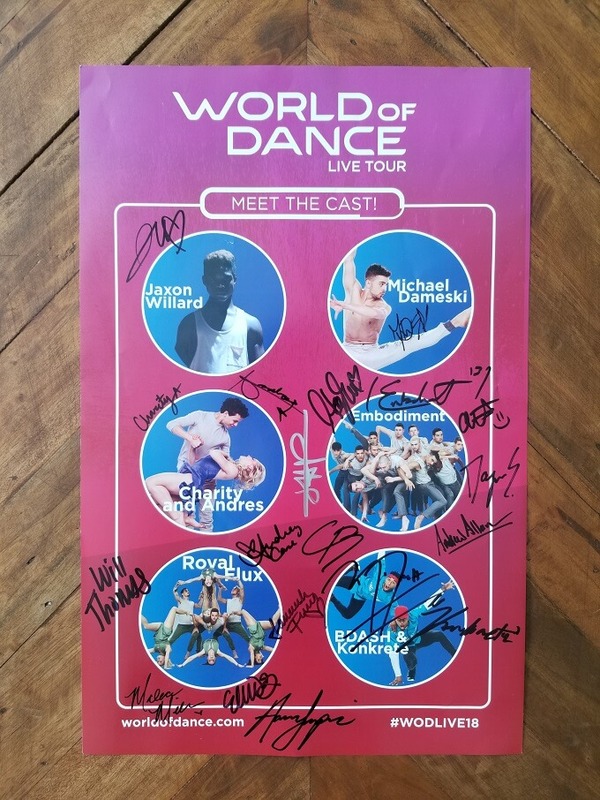 As we entered the room, each person received a World of Dance Live Tour “Meet the Cast” poster, which was uniquely designed to include photos of all of the current show’s performers and enough space left over for their autographs. 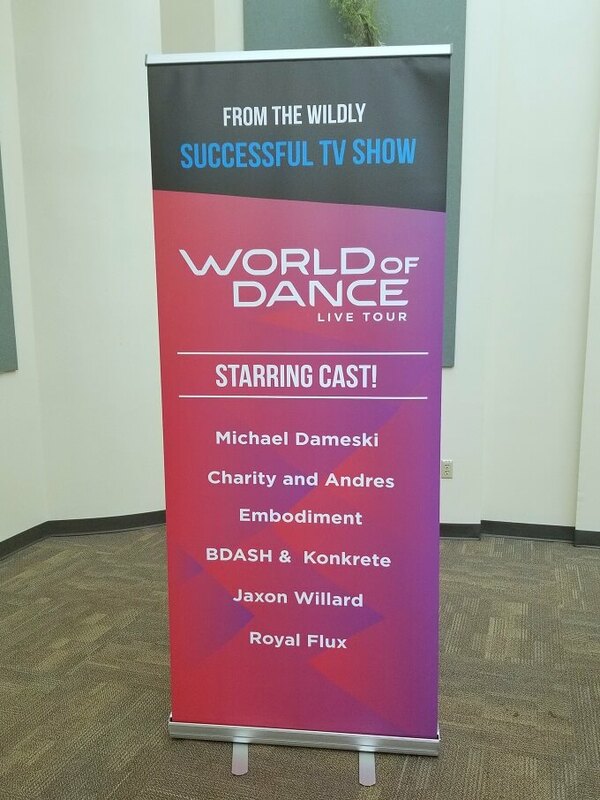 Our show lineup included Jaxon Willard, Michael Dameski, Charity and Andres, Embodiment, Royal Flux, and BDASH & Konkrete. The dancers were seated at two long rows of covered conference tables that converged at a 90 degree angle. The line moved a little at a time, to allow guests to have their posters signed and to take pictures, if desired, with the dancers. Every single one of the dancers was friendly, and many of them engaged my daughter in conversation about the show—or about her t-shirt, which was decorated with pizza slice graphics. She was thrilled with the personal attention and didn’t stop smiling the entire time. I took pictures of her with all of the soloists and duets; it seemed a little too rushed to snap a pic with the ensembles, too, but I’m sure they would have been happy to take a group photo had we asked. By the time we had reached the end of the tables and snapped the final photo (with Michael Dameski, whose Australian accent was even more adorable in person), we were both grinning and giddy. The whole process only took a few minutes, but felt entirely worth the cost. We came away with a lovely poster covered in autographs and great memories of interacting with the dancers. The show was held in a large auditorium, and it appeared to be sold out or close to sold out. The stage was minimally decorated with three large screens. Before the show began, they glowed with the World of Dance Live Tour logo. As soon as the show kicked off, they lit up with a variety of marquee and background effects, reminiscent of the massive screens on the set of the television show. The opening number featured what appeared to be the entire cast of the tour in one big group number. It was fun to see them all on the stage performing in unison despite their wildly different backgrounds and dance styles. When the opening number was complete, I expected some sort of master of ceremonies to come out. To my surprise, the entire performance was hosted by the dancers themselves. One or more of them would amble out for ad-libbed remarks, a short skit, or just general clowning around. It created an intimate atmosphere, as if you had just stumbled into a magical rehearsal session where it was just the dancers and you. Even if it was just to save the production company a few dollars, I’m glad they let the dancers do the talking rather than some hiring some M.C. to provide patter. I’d assumed that we would see many of the same dance numbers that had appeared in the show, with a handful of new choreographies mixed in. It turned out to be a pretty accurate assumption. We recognized some of our favorite performances from Jaxon Willard, Michael Dameski, Charity and Andres, and BDASH & Konkrete. I had guessed that some of the more dangerous-looking tricks might be toned down for the tour, but there were quite a few moments where the audience gasped at a particularly daring jump, flip, spin, or drop. One enjoyable innovation of the live tour was how the dancers transitioned between numbers without resorting to closing the curtain or fully blacking out the lights. For most of the transitions, the preceding dancer remained on stage as the upcoming dancer (or dancers) came on stage, often with an interesting bit of movement or dialogue as the performers briefly interacted while coming and going. Sometimes the dancers were combined in new groups, such as when Charity joined the women of Royal Flux for a dance that was themed around the concept of women’s rights. These interactions and recombinations were the highlight of the show, and they also showed how the television format could potentially be expanded by allowing the dancers to perform together. I’d been a little bit concerned that the cast would phone it in, since the pressure of the competition was off, but I needn’t have worried. From our viewpoint, they were just as energetic as ever. In fact, they were even more captivating live. Charity exudes power and energy. When she’s on stage, you practically can’t take your eyes off her. She and Andres were a powerhouse team both on TV and in person. Jaxon Willard’s contrast of strength and vulnerability was even more arresting when viewed live. Michael Dameski is a phenomenal dancer, but he’s also quite the comedian! We enjoyed his funny bit with Royal Flux. Royal Flux was an excellent example of how the best ensembles have an intuitive dynamic between dancers. They moved as a coordinated unit made up of complementary moving parts. Embodiment had fewer dancers present than in the television show, but (despite that) brought great energy to the stage. It was kind of strange to not have Ne-Yo around to comment about their masculinity, which I sort of expected to hear every time they came on stage. BDASH & Konkrete make krumping look effortless and otherworldly. Their narrative-based performances, like the scary clown-themed duet originally seen on TV, are fascinating to watch. They were our favorites and we hope to see more from them in the future! I would gladly attend another World of Dance tour show, even if it were the exact same lineup—or, maybe even especially if it were the same lineup. It’s that good. If you like World of Dance the television show, you will be enchanted by the World of Dance Live. Got questions about the World of Dance tour show or the VIP experience? Ask in the comments! I’m not familiar w/ this show, but it looks like you guys had a great time! I’ve never seen the show, but the live tour looks like it would be a fun way to spend an evening. I’m always mesmerized by the talent of artists, especially dancers. That must have been a blast. Meet and greets with people this talented are always fun. I wish I had known about this. I really would have loved to have been there. It would be so cool to go to the World of Dance Tour! Sounds like a lot of fun and a great experience! What a great opportunity. It looks like such a great time and all those autographs?! Such fun. Oooh this looks like such a fun time! My niece would really love this! Wow, it sounds like you and your daughter had such an amazing and memorable time at the World of Dance Tour Live Show! The VIP ticket price sounds like you got your money’s worth!! Wow. This review was exactly what I was looking for to justify the expense of the VIP tickets. You helped immensely. Thank you for taking the time to share you and your daughter’s experience. I hope my evening is as magical as yours was. I really love this show – so I bet that this was such a fun event. I wish that I could take the time to go to one. This is an awesome event and learning from the professional dancers. Dancing gives a huge impact to many lives. Thanks for this recap! We just went to the show in Ridgefield, WA last night and I was blown away by the power and energy of the dancers that comes across when you see them live. I especially agree with your comment about Charity. I actually thought she and Andres were the tiniest bit overrated on the show compared to some of my other favorites, but seeing them live was a different experience. Her strength and passion are palpable, and his expressiveness came through in a way I hadn’t seen on the show. Maybe they’ll come back for Season 3? Now I want them to take the whole thing! Glad you and your daughter had a great experience meeting the dancers too!